- Useful for home/Factory/articiane etc. A jewelers saw frame is a necessary tool to have if you are designing new jewelry pieces. You have the capability to use a variety of different saw blades in the frame. Use it to cut out silver and gold jewelry like pendants, earrings, rings and more. Revolutionary design in two lightweight, perfectly balanced saw frames. We offer Mini Hacksaw Frames. Saw frames adjustableThese is made up of steel and frame is adjustable. 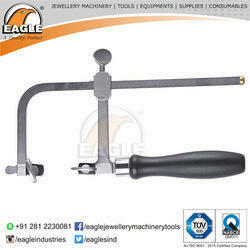 Banking on our enriched industry experience, we are able to supply Hacksaw Plastic Handle. - Sizes: 2" (60 MM), 2.5" (75 MM), 3" (80 MM), 3.5" (90 MM), 4" (100 MM), 5" (120 MM), 6" (150 MM). - Weight: ST/G01 145 g., ST/G02 160 g., ST/G03 165 g., ST/G04 170 g., ST/G05 175 g., ST/G06 180 g., ST/G07 190 g.
Saw frame These are made up of steel and non adjustable. Economical junior frame ideal for small and tricky jobs. Moulded PP Talc Handle with Max Tensile Strength. Steel dowels. Shatter proof blades.